↑ "Westwood becomes world number one". BBC News. October 31, 2010. ↑ Kelley, Brent (October 20, 2009). "Woods Clinches PGA Player of the Year Award". About.com: Golf. สืบค้นเมื่อ December 2, 2009. ↑ "Tracking Tiger". NBC Sports. สืบค้นเมื่อ June 3, 2009. ↑ Earl Woods. Telegraph (June 5, 2006). Retrieved June 19, 2012. ↑ "Earning His Stripes". AsianWeek. October 11, 1996. สืบค้นเมื่อ June 18, 2009. ↑ "Woods stars on Oprah, says he's 'Cablinasian'". Lubbock Avalanche-Journal. Associated Press. April 23, 1997. Archived from the original on December 12, 2007. สืบค้นเมื่อ June 18, 2009. ↑ Callahan, Tom (May 9, 2006). 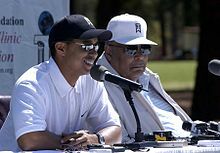 "Tiger's dad gave us all some lessons to remember". Golf Digest. สืบค้นเมื่อ January 24, 2012. ↑ Chandler, Rick (June 7, 2012). "Tiger Woods' niece makes her major pro golf tourney debut today". NBC Sports. สืบค้นเมื่อ June 7, 2012. หน้านี้แก้ไขล่าสุดเมื่อวันที่ 16 เมษายน 2562 เวลา 12:40 น.